Enjoy our collection of New Year Holiday Printables, free for home or classroom use. 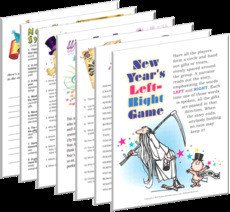 You'll find ready to print craft sheets, activity pages, masks and coloring pages for New Year's eve on this page. 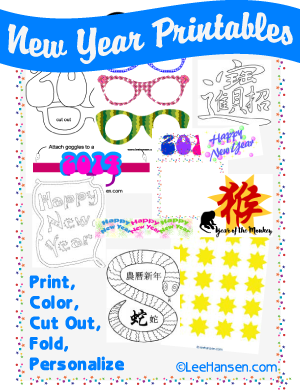 Print, color, decorate, cut and paste activities for January 1 and Chinese New Year. Make some fun with a crafty party hat or mask activity on New Year's eve or January 1st. 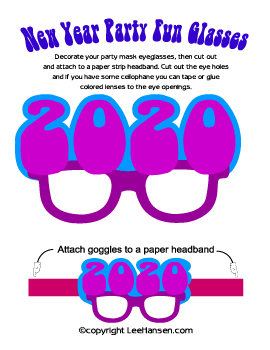 We have a nice collection of printable masks including specialty eyeglasses with the current year, or other fashionable masks and crowns to help kids ring in the New Year with style. 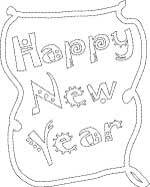 You'll just be hopping with delight over these printable New Year coloring pages. Print our creative fun sheets for party activities at home or in the classroom, or use them to design your own coloring crafts, invites and party decorations. Printable letter size sheets, border papers to write down your resolutions, make scrapbook pages, write a letter for your time capsule, or create guest lists for your New Year party. Print the sample size graphics to make name tags or table cards.